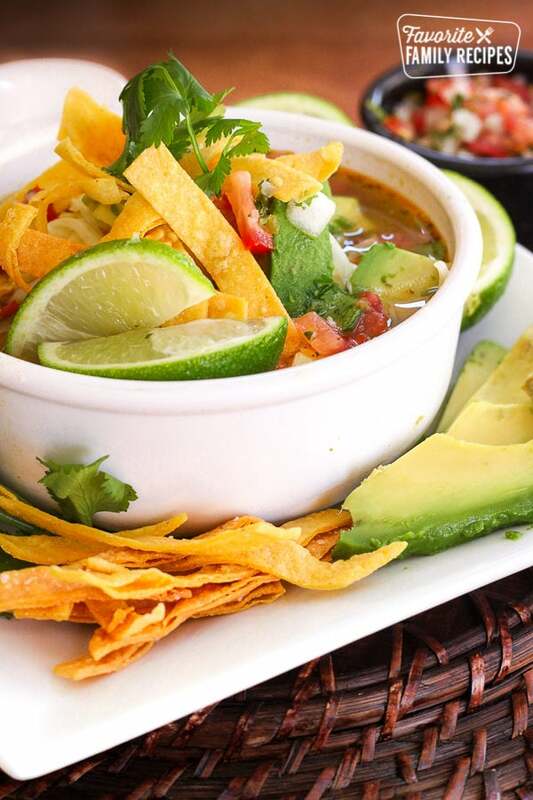 If you love Cafe Rio’s Tortilla Soup, but don’t want to go out – don’t worry! We’ve got you covered with this AMAZING copycat recipe! I have been so excited to post this recipe, you have no idea. I love Cafe Rio’s chicken tortilla soup and have been wanting to duplicate it forever, I just haven’t gotten around do doing it until now! I am not going to lie — this is my personal favorite tortilla soup recipe and it tastes just like Cafe Rio (if not BETTER). It is so fresh and delicious, you are going to love it! Just a few side notes. You can throw the chicken in the crock pot with the broth and it will probably still be amazing, but personally I LOVE the grilled chicken taste. Grill it if you can! Also, you will notice I added pinto beans (not the Cafe Rio original way of doing things but it is totally worth doing). I liked it better actually and it makes the soup go further. If you want to keep it EXACTLY like Cafe Rio feel free to leave them out. And one more thing (because I am sure I will get e-mails about it).. instead of adding a scoop of guacamole (as I know Cafe Rio does), I just did diced avocado which just saves time having to make a separate little thing of guacamole (plus, I love having the chunks of cool avocado in there)! 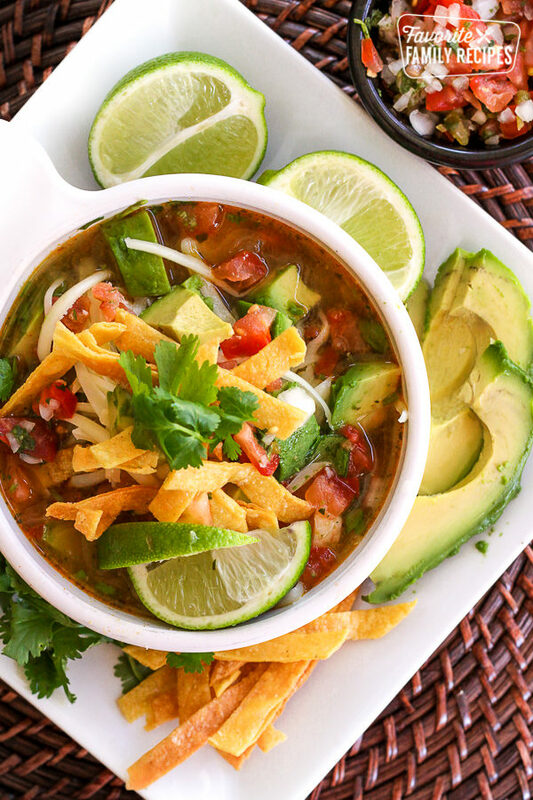 If you love Cafe Rio's Chicken Tortilla Soup, but don't want to go out - don't worry! We've got you covered with this AMAZING copycat recipe! In the meantime (when you are close to serving), combine taco seasoning and paprika. Brush chicken with oil and rub with taco seasoning/paprika mixture. Grill chicken over medium-heat until cooked through (try to turn only once during the grilling process). Remove from grill and shred. In individual bowls layer chicken, about 1/3 c. pico de gallo, 1/3 c. diced avocado, and 1/3 c. pepper jack cheese. Ladle about 1 cup of chicken broth directly over the layers. Top with tortilla strips and garnish with cilantro and lime wedges. I will be making this this week. I love your recipe. I think I will add some Rotel tomatoes to my soup or some of the Pico. I like tomatoes in my Tortilla Soup. I’ve never had Cafe Rio, but grilled chicken in a great chicken broth sounds wonderful to me! That’s funny; I had the same thought! I just made this tonight and added Rotel. It is perfect! I have never had their soup. I’m one of those people who gets the same thing every time, because I just love it so much. But I totally want to try this out. It looks so good. Plus I love your other Cafe Rio recipes. They are better than the actual Cafe Rio in my opinion. Thanks for sharing. I’m making this tonight! I made crockpot chicken tacos last night, so I am using the leftover shredded chicken instead. It looks so good, thank you for the recipe!! This is my favorite thing to get at Cafe Rio when I only want to spend $5. Thank you so much for sharing this! I made this today because it looked so good! It was delicious! Thanks for the recipes! Erica I LOVE you for figuring this one out. I LOVE this soup, I order it every time I go to cafe rio (far and few in between but at least they finally have one somewhat close in CDA). It’d be so much easier to make at home instead of stuffing myself with soup and a salad cause I love them both so much. Thanks Britt!!! We miss you guys! Thank you soooo much for the recipe. I live in Japan but everytime we go home to Utah for a visit Cafe Rio is the first place we go to. I love this soup. My husband usually gets something else and I get the soup and we share. I have been wanting to try and make this forever and now I can try. Thanks again. Amazing! Oh my gosh! I tried their soup for the first time last night. I usually get the Tostada (my fave), but I had some work done on my teeth, so I needed something easier to eat. I had no idea I was going to LOVE the soup as much as I did. I immediately had to search for a copycat recipe and here one is. I can not wait to try this. BTW – your pics are gorgeous! This is as good as my recipe. The only thing that I do differently is that I use rotisserrie chicken, shred it and add the three ingredients used to rub the chicken and quickly heat up in hot pan. Then I start building up the ingredients in the bowl. The “BOMB”. My husband loves this soup anytime of the year. Rotisserie chickens add sooo much flavor to soups! I never throw away the deboned chicken without making chicken broth also! Wow, Great pictures! This looks fantastic! Will be trying soon! Found you on pinterest. I was hoping you would figure this one out! I was going to request it, so thank you! Can’t wait to try it! I made some modifications and it turned out delicious! I grilled the chicken and sautéed the onions in the same pan (just because I’m lazy like that) and put it in the crock pot to simmer with the broth. I switched out the pinto beans for black beans. I also served it with sour cream, the sour cream on top melts a little with the hot broth and was very yummy! 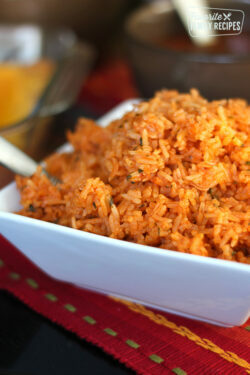 Adding rice too would probably help it go further for a crowd. My husband isn’t generally a soup fan, but he LOVED this hearty, flavorful soup. I’ve had the cafe rio version, and I actually liked this more! I liked the diced avocados better than guacamole, because as you mentioned, the cold chunks are delicious! I personally LOVE Cafe Rio! Thank you sooooo much! i have never ate at cafe rio but i did make this soup today and it was delicious! i did tweak it just a bit for my own taste, and i seldom measure things unless baking…but i was very pleased with the result and will definitely make this again!!! I made this recipe for my family. I wouldn’t say it is exactly Cafe Rio’s recipe, but found it to be better. Yum!! 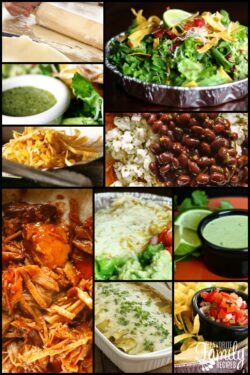 Have you ever made this with black beans? 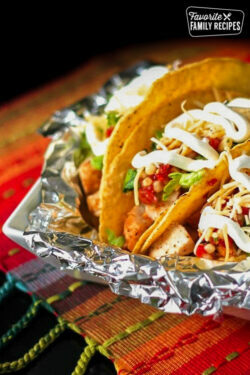 I just realized I’m out of pinto, but I”m dying to make this right now! I haven’t but I am sure it will still be great with black beans! So, I know this reply is 2 year late, BUT I made this soup tonight with black beans and it was very tasty! I had company over and they loved it! Thanks for the recipe! Better late than never 😀 Thanks for taking the time to comment! I’m not a big soup person but I made this last night and wow! It is the best soup I’ve ever had! So flavorful and really hits the spot. My husband said this can stay on the keep list! Made this for dinner tonight. Except I used black beans, added corn and used a whole chicken (boiled) shredded and then used a skillet to season the chicken with the taco seasoning ect… I also made the pico de gallo…yummy!!!! The real soup recipe has rosemary in it. Anyone know the calorie count of a cup of this soup? MINUS the strips and the picode gallo. It is so good. I used to work in a resturant that served tortilla soup and have been looking for a receipe. Thanks Cafe Rio wherever you are. I was skeptical before trying this, but holy cow, THIS IS IT! It has SO MUCH FLAVOR! I followed the directions for grilling the chicken (I did it 1 piece at a time on my mini George Foreman) and it was awesome! The spices in the rub were delicious. I put in the pinto beans as recommended (and I agree that makes it better than Cafe Rio’s). I did buy the pico de gallo at the grocery store instead of making my own, and I mashed up the avocados instead of dicing them. This is a solid recipe. I’ll do it the same way again. THANK YOU for figuring it out! 🙂 Well done. Our son and 3 of his college aged friends were home for a visit when we decided to embark on an adventure for dinner. After looking at the recipe, and determining it would take about 2 hours to pull this off, it looked so good that all the kids filed into our tiny galley kitchen and began to dice and chop and measure and stir. From the simple broth which we simmered on the back burner for 2 hours, to the fresh pico de gallo and the smokey grilled chicken the soup was perfect. I pared it with another fan favorite around our home, Taco Ring. What a memorable meal time with our 20 somethings. Certainly one which will not soon be forgotten. Made the soup again tonight for just me and my husband, we both worked on it, that’s part of the enjoyment! I have made this twice since I found your recipe. It is awesome!!!!! Thank you for sharing!!! I have made this several times for my husband I, and we love it. I am making it soon though for company and I am trying to decide what sides would be good with this… Any suggestions? made this tonight and it was really good! I am gonna have a bowl for breakfast when I get up!!!! My girls loved it too!! mmmm we love this soup!!! I made this last night and it was delicious !! My entire family loved it, and all was gone;) I love this easy recipe and I strongly recommend it to all 😉 yummy!!! This looks absolutely amazing and I’m sure it tastes even better than that! I’m loving the chunks of avocado in it! Great soup!! Thanks for the recipes. Made this tonight and it was amazing! I just used corn chips instead of tortillas, but the avocado chunks tasted so good! Never had Cafe Rio, but this soup is awesome! Just wanted to ask if this soup has alot of claories or if it is a good way for loosing weight? Looks delicious. I am going to give it a try. I’m pretty sure there are carrots in Cafe Rio’s soup. Diced ones. Thanks for the recipe! Made this tonight for dinner! Delicious!! I am definitely making this again! Made this last night……did just add the sams chicken but it was SO good, ty for sharing! This was a winner! my whole family loved it!!! this made just enough for one meal for us. next time i will double it! I’m so happy this was a hit with your family! Thanks for sharing! Delicious soup! 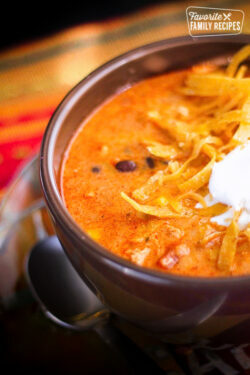 I have tried a lot of recipes for chicken tortilla soup and this one is the best! Very fresh tasting. One of my favorites. A must make! Thank you so much for this recipe! I have never been to a Cafe Rio, but I was looking for a chicken tortilla soup recipe and gave this a try. I’m so glad I did! I will be making this over and over. why do you need beans in this recipe? the cafe rio soup doesn’t have beans. would the taste be altered If I don’t add the beans?